The north view is shown here with faults. All images are available with or without faults. View a medium quality 170K JPEG image in your web browser: without faults, with faults. View a close up (~140K) of the East Bay with faults, Monterey Bay with faults, Silicon Valley with faults. Download* a US Letter sized high quality JPEG (~800K) for printing at home: without faults, with faults. Download* a close up (~600K) of the East Bay with faults, Monterey Bay with faults, Silicon Valley with faults. *To download the JPEG's for printing at home press the right mouse button and select 'save this link as...', 'download this image to your hard disk' or similar instruction to save the image to your computers hard disk. Then open in any compatible image editor to print (eg. QuickTime Picture Viewer, JPEG View, Adobe Photoshop). Download an image editor if you do not have one. Download full sized JPEG*: without faults, with faults. 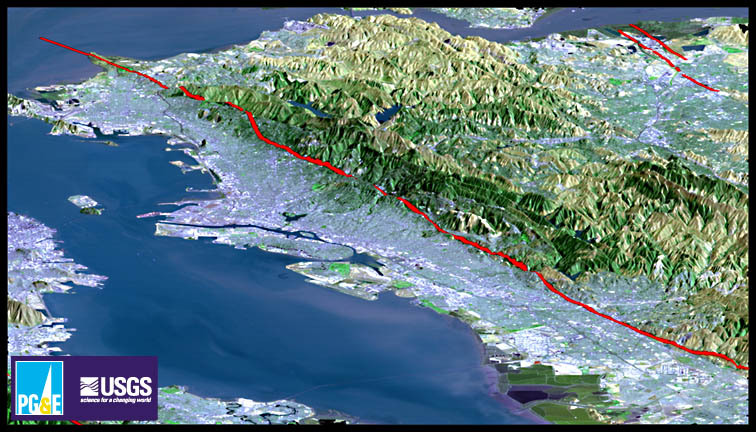 Download a close up of the East Bay with faults, Silicon Valley with faults. *These are 10 MB files and should not be downloaded via modem by home users. Download the full sized TIFF*: without faults, with faults. *These are 30 MB files and should not be downloaded via modem by home users. Disclaimer: The appearance of the names or logos of collaborating organizations are provided for information only and do not constitute endorsement, express or implied, by the U.S. Geological Survey (USGS) or the U.S. Government of the referenced organizations, their suitability, content, products, or services, whether they are governmental, educational, or commercial.